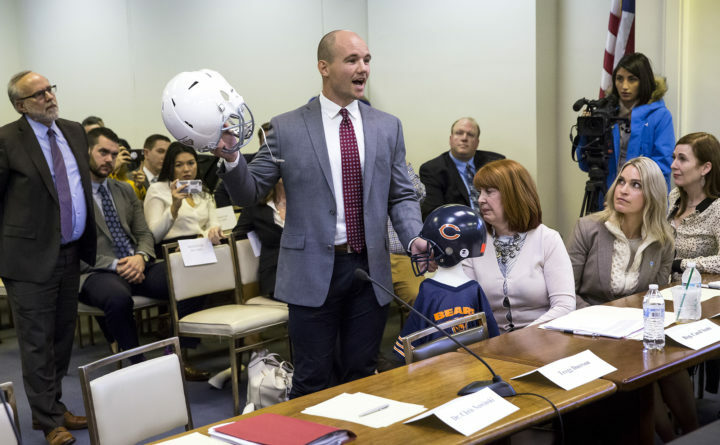 Chris Borland, a former NFL linebacker and Big Ten Defensive Player of the Year for the University of Wisconsin, testifies in March 2018 before an Illinois House Mental Health Committee hearing on a bill that would ban tackle football for kids under 12 years of age. A database containing concussion, or traumatic brain injury, information on tens of thousands of Maine students is helping researchers at Harvard Medical School and other medical science facilities learn more about the long-term effects of concussion, as well as rates, prevention and recovery. Since 2009, the Maine Concussion Management Initiative, based at Colby College in Waterville, has provided software to more than 100 Maine high schools and the New England Small College Athletic Conference schools, allowing athletes to essentially play a 30- to 45-minute video game — the ImPACT test — that measures memory, reaction time, speed and concentration. The test provides researchers with a “baseline” view of their brain, according to MCMI spokesman Lynn ‘Kip’ Kippax. That baseline becomes important when a child suffers a concussion — when someone suffers a blow to the head or body, causing the brain to bounce around or twist in the skull — because providers can then compare brain function. Without that baseline, a post-injury test score can only be compared to the general population, according to the Sports Concussion Institute. But with a baseline test, following an injury, clinicians can “compare apples to apples,” the institute states. “Also, because baseline testing usually occurs early in the season, the very act of getting tested will raise concussion awareness for athletes, parents, and coaches,” it continues. Lisbon, Mt. Ararat of Topsham and Boothbay Region High School are among more than 100 schools in Maine to test students prior to athletic seasons. Two weeks ago, Boothbay tested its 10th-graders, and last week all eighth-grade athletes and some of their classmates were tested, school nurse Kate Schwehm said Thursday. The test is voluntary, but Schwehm said it is mandatory for all students who wish to participate in school-sponsored sports. As concern has increased in recent years about the long-term effects of concussions, Dr. Paul Berkner, DO, director of health services at Colby College, began collecting data — stripped of identifying information — in 2009. Since then, the not-for-profit program has grown into the Maine Concussion Management Institute, connected to Colby College, which provides its facilities. The data — which Kippax called “startling” — are being used by Harvard Medical School, Children’s Hospital Boston, Spaulding Rehabilitation Hospital and other research institutions to study the effects of concussion. They partner with the Maine Principals’ Association, the Maine Athletic Trainers Association and other state organizations, according to the initiative’s website. “The Maine Principals’ Association and the Maine Principals Sports Medicine Committee encourage schools to participate in the program,” Assistant Executive Director Michael Burnham said Friday. The MPA provides schools with contact information about the institute and sets up the training, but Burnham said the MPA has not yet mandated the testing. Instead, he said, “we have focused our efforts on educating the coaches” about concussions. The Maine Concussion Management Initiative provides schools with the software for baseline and post-injury testing, and has trained more than 1,000 physicians, school nurses and other providers in concussion prevention. Schwem, at Boothbay Region High School, said concern is growing among those who work with school-aged children, and others, not only about significant concussions, but the smaller hits that in the past may not have been monitored. “It’s not necessarily the big, dramatic concussions, but the repetitive head injuries that really add up,” she said.